The makerspace at Abilene Christian University has been operational since 2015. It is unusual in that it is an academic space at a private university that offers equal service privileges to both the campus and the community. In an attempt to encourage a maker mindset within our broader region, we began offering a series of day camps for elementary and middle school students. To our surprise and delight, the homeschool community became our biggest group of participants. What started as serendipity is now a conscious awareness of this group of patrons. In this article, I outline how our camps are structured, what we discovered about the special needs and interests of homeschool families, and how we incorporate this knowledge into outreach and camp activities. I also share how we evaluate the camps for impact not only upon campers but also within the larger goals of the library and university. Makerspaces, also known as Fablabs or hackerspaces, are a growing area of service for libraries. Makerspaces are places that combine tools, technology, and expertise to let people create physical and sometimes digital objects. Initially found mostly in engineering departments, makerspaces have grown internationally to encompass all disciplines and ages (Lou & Peek, 2016), placing them well within the mission scope of academic, school, and public libraries. Central to the ethos of makerspaces is the idea of community. Makerspaces allow individuals from all ages, experience levels, and backgrounds to come together and collaborate in a shared space. In his formative essay, Dale Dougherty, founder of the maker movement, suggests that the ability of makerspaces to transform education is that they offer anyone a “chance to participate in communities of makers of all ages by sharing your work and expertise. Making can be a compelling social experience, built around relationships” (Dougherty, 2013, p. 9). 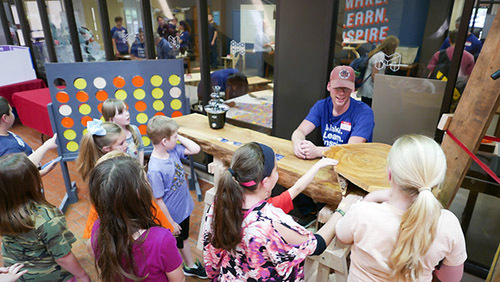 The library at Abilene Christian University (ACU) seeks to encourage this educational transformation through its own makerspace, which we call the Maker Lab. First opened in 2015, the ACU Library Maker Lab is an academic makerspace that is open to all areas of the campus as well as to the public. In an attempt to grow the maker mindset both in our community and among our campus families, we decided to host a series of children’s and youth day camps called Maker Academy. To our surprise and delight, the homeschool community became our biggest group of participants. What started as serendipity is now a conscious awareness of this group of patrons. This article will outline how our camps are structured, what we discovered about the special needs and interests of homeschool families, and how we incorporate this knowledge into outreach and camp activities. We will also share how we evaluate the camps for impact not only upon campers but also within the larger goals of the library and university. College preparedness and overall learning is a concern that academic librarians share with their colleagues in public and school libraries, so involving the kindergarten to 12th grade (K-12) population at universities is not unheard of even though it may not be commonplace (Tvaruzka, 2009). The University of Nevada began holding workshops for teachers of K-12 students to familiarize them with college research assignments and to help them infuse age-appropriate library skills into their own assignments. They expanded the program to involve middle school students to introduce them to the support and services a college library can provide (Godbey, Fawley, Goodman, & Wainscott, 2015). At the University of South Alabama, librarians conduct summer enrichment programs to enhance the research literacy of high school students who are preparing for health careers (Rossini, Burnham, & Wright, 2013). Although they may not work extensively with children and teens, libraries of higher education do reach out to younger people. Camps and summer experiences are a different environment from formal classes, and necessarily require different activities and teaching techniques suitable to the age of the campers. Academic libraries vary in the degree to which they are directly involved with K-12 summer activities. Many offer tours and scavenger hunts for children on campus as part of other events (North Carolina State University, n.d.; University of Michigan, 2017; Washington State University Libraries, 2018). Others interact with academic camps hosted by different departments to do a session on research skills, often with a more informal and problem-oriented approach. Ohio university librarians, for example, developed interactive ways of introducing high school engineering students to their discipline’s literature and the role it plays in developing new products (Huge, Houdek, & Saines, 2002), and a team of librarians at Carnegie Mellon expanded their roles to work with middle school girls pursuing engineering (Beck, Berard, Baker, & George, 2010). Each example offers a good description of adapting traditional library content, and teaching brief research workshops for youths. The literature has fewer examples of extended camps that involve the library for the entirety of the camp experience. Temple University Library in Philadelphia involves high school students in a summer intensive initiative to do community mapping and thus build knowledge of Geographic Information Systems (GIS) coding (Masucci, Organ, & Wiig, 2016). In a collaborative model, the University of St. Thomas partners with St. Paul Public Library to host a five-session series for middle school students to implement laser cutting, circuitry, and basic engineering design skills (Haugh, Lang, Thomas, Monson, & Besser, 2016). Virginia Commonwealth University Library works with its School of Engineering to offer extensive research instruction appropriate for youths participating in a campus camp where they design and prototype their own inventions (Arendt, Hargraves, & Roseberry, 2017). In these examples, the library is more of a full partner and host of the camp experience, although they typically share the work with other units. With respect to homeschool students, a surprisingly small body of literature addresses the educational needs of the audiences the library serves as opposed to the programs the library offers. By far, any information regarding library service to homeschoolers is from a public library perspective. This paucity of articles, especially of recent publication, suggests a gap in the literature, The majority of articles discuss the interests of families who homeschool and the implications upon library programming and collections (Blankenship, 2008; Johnson, 2012; Shinn, 2008). Paradise talks about the need to have child-friendly environments, especially with computer accessibility, that accommodate families and children working for extended sessions (2008). Others have observations about communication and outreach, noting that families who homeschool tend to connect with each other at the community level, making it imperative that the library utilize these dialog channels to reach out to members (Hilyard, 2008; Willingham, 2008). Particularly relevant to those planning educational activities is an article on creating successful programs for children in homeschools and the need to include hands-on learning (Mishler, 2013). Although these sources have a public library orientation, they provide useful suggestions for other librarians from libraries experienced in working with homeschooled youths, especially to those librarians in higher education, who may be less familiar with this age group. Abilene Christian University is a private university located in Abilene, TX. With an enrollment of just under 5,000 students, ACU falls within the Carnegie classifications as a “Masters Colleges and Universities: Larger Programs” institution. There is one library on campus that serves all disciplines. The Maker Lab is an 8,000 square foot space within the library. It was established in 2013 with funding from the university Provost’s Office and the library’s own budget. It has many of the tools typically found in makerspaces: 3D printers, a laser cutter, vinyl cutter, sewing machines and fiber arts supplies, power tools and hand tools for woodworking, and electronics workbenches. It is staffed by a full-time lab manager, a librarian who divides her time between the Maker Lab and the regular reference and instructional services within the library, and a cadre of student workers who supply a total of 132 student hours a week, Monday through Saturday. Most of what the Maker Lab offers is free. There is no membership fee or charge for tool usage or machine time. We do charge for some materials, like 3D printer filament, sign vinyl, or large sheets of plywood. The full list of materials and their prices are available via the Maker Lab Store1. Makers are welcome to bring their own materials if they want something other than what is already on the premises. We maintain a fairly robust “scrap pile” of leftover and donated material, and these are free. We have found that having materials on hand, particularly free scrap, is a good way to encourage newcomers to try something and helps overcome initial barriers to getting started. A significant distinction of the ACU Library Maker Lab is that it is completely open to all individuals regardless of whether they are affiliated with the university. This policy was a deliberate decision from the space’s inception. The ACU Library as a whole has a rich tradition of serving anyone who is in the building and of collaborating with other libraries of all types in the area. The Maker Lab continues that tradition. Even the computers in the Maker Lab do not require a special university login. The space is designed to be as convenient as possible for all makers to use. Since its opening, the Maker Lab has enjoyed a healthy yet somewhat narrow use among our institution’s population. We wanted to build upon our user base and encourage a maker mindset among other groups. This desire was the inspiration for Maker Academy. Maker Academy is a series of day camps for kids. We first offered it in the summer of 2014 and have continued every summer since then, refining the program each year. We presently have three camps: one for children in 4th and 5th grade, and two middle school camps for youths in 6th through 8th grades. Each camp lasts three days and goes from 9:00 a.m. – 4:00 p.m. We charge $100 per maker. This fee covers all making supplies, lunch and snacks for each day, and a camp T-shirt. We host the camps as outreach, not a profit-making activity. We do not make money from the camps. We cap registration at 20 makers per camp because that is the maximum our space and staff can accommodate. Maker Academy introduces kids to tinkering and learning through making. From activities like building catapults, kites, and go-carts, they learn science principles as well as prototyping and fabrication skills. They might learn soldering and basic circuitry to wire a lamp or make an Arduino robot – a small microcontroller or simplified circuit board designed to operate mechanical devices. They experiment with various pieces of graphics software to create their own T-shirt designs or decorations for their projects. Each activity fosters curiosity, problem solving, and creativity. Activities change each summer to give makers a new experience each time. We initially advertised the camps to those we thought would be our primary audience, namely children of faculty and youth in local schools. We made posters, sent email blasts, wrote campus newsletter articles, posted on blogs, and advertised on the library’s web page. We talked with many colleagues personally. We sent out fliers and emails to public elementary and middle schools in the area. Then we eagerly waited to see who would enroll. For the first set of camps, only 12 kids registered. It was a very disappointing turnout for all the effort we expended. We distributed more emails and more reminders, but they made little difference. The turnaround occurred when a parent who homeschooled heard about the camps through a source unknown to us, and volunteered to share the news on the local homeschool listserv. Within one day, all the camps filled up and overflowed to a waitlist. We were overwhelmed and amazed. We realized that we had unintentionally overlooked a significant portion of our community and sphere of influence. We needed to focus more on the homeschool community and how we could include them, not only in our marketing, but as a planned audience in our programming. But first, we needed to know more about this population. We wanted to understand the needs of those who homeschool and how the library could speak to those needs. We found helpful published information that we mentioned earlier in this article, but most of what we learned came from speaking with parents, observing the kids, and getting feedback along the way. Over time, we noted several characteristics of local homeschool families that inform how we structure our outreach and services. Homeschoolers are a tight community with a culture of sharing. Those who homeschool often do so because they can choose their own curriculum and approach to education. There is no national group that oversees homeschool education. Because of homeschooling’s independent nature, there is no single association to which homeschool families will belong and from whom the library can get a convenient list of members in its area. While there are broad-based companies that offer customized curriculum guides, homeschooling tends to be organized around multiple state or regional groups and small co-ops for common interests. It is incumbent upon the library to identify these groups in order to reach members. The local homeschool groups not only connect members but they also foster information sharing. Since there is no central governing agency, families share news among themselves about homeschooling. The regional groups provide a loose organization in which the sharing takes place. If the library can identify the local homeschool groups, it can become part of the resources that will be shared with others. Homeschool groups have specialized but very effective communication channels. Parents exchange information, curriculum ideas, and expertise via email lists. Local chapters will announce education activities that support independent learning. These listservs and announcements often constitute the main vehicle of support for homeschooling families, so they are very active and very efficient (Turner, 2016). More importantly, they also tend to lie outside a library’s traditional outreach channels. When the parent who homeschooled posted the news about our Maker Academy, all it took was one initial email for most of the local homeschool community to know about the camps and to respond. It was a very effective means of communication. To use it, however, we had to get on the email list. We realized that our usual outreach channels were not as widespread as we thought, and we needed to expand our reach to draw in this special yet substantial portion of our community. Homeschoolers are anxious for innovation and meaningful educational opportunities. Surveys indicate that dissatisfaction with academic instruction at traditional schools is the second highest reason families decide to homeschool (McQuiggan & Megra, 2017). The same survey goes on to report that 39 percent of homeschool families rank a desire for nontraditional instruction as “important.” Real world, personalized learning is valued by many who practice homeschooling. This is good news for libraries because innovative learning is very much what makerspaces are all about. Nearly every activity in our Maker Academy involves hands-on learning with a direct tie to real world skills. For example, students participate in making their camp T-shirts and learn about screen printing and vinyl cutting. They learn how a basic circuit works and put that knowledge into practice by wiring their own custom-made lamps. Especially effective are activities that build upon recently acquired skills and that naturally scaffold up to more advanced knowledge. We frequently will start beginners with a “learn to solder” project where they connect LEDs to a battery to make a wearable badge that lights up. Soldering, we explain, is the basis of many electronic projects. Then we introduce a switch where they can turn the light on and off. Next they solder multiple switches to connect a speaker to amplify music from a cell phone. Learning by doing lets young makers build their knowledge in ways that are effective, practical, and that both they and their parents can appreciate. Homeschool families, like anyone else, appreciate free tools they can use at home and shared resources they can use at libraries. When asked where they get educational material, over 70 percent of homeschool families cite free content on websites and material from the public library as their main sources of curriculum material (Redford, Battle, & Bielick, 2016). They are looking for tools that are easily accessible and affordable yet provide quality education. This creates a rich opportunity for the library to teach with open source/open access tools. It is the nature of makerspaces, and increasingly of libraries, to embrace and even favor open source and open access. Although many of the high-tech machines in a makerspace are expensive, they run using open source software that anyone with a computer can download for free. We promote these tools in Maker Academy. We take the classes to our computer lab and introduce them to design programs like Inkscape for graphics and TinkerCad for 3D design. We tell them and their parents that this software is free and that they can use these tools at home and then come to the library to print their designs on a laser cutter or on a 3D printer. This opens enormous possibilities and leverages the library-community relationship. It creates opportunities to maintain contact as homeschool families come back after camp to use the library. Many homeschool families look for opportunities for their children to engage socially and to work as part of a team. Researchers define socialization differently, and the answer to the question of what it means to be properly socialized is a highly personal one. However, there is some general consensus that socialization involves a common set of abilities: (a) functional life skills that enable people to operate successfully in the “real” world; (b) social skills including the ability to listen, to interact, and to develop a strong sense of identity and values; and (c) a sense of civic engagement, or of being willing and able to give back to society (Kunzman, 2016; Neuman & Guterman, 2017). Homeschool parents are aware of the need to avoid isolationism, and they actively seek opportunities that provide socialization experiences in ways that conventional schools may not. They want their children to respect others, to develop a sense of teamwork, and to get along with people of diverse backgrounds. They use a variety of resources outside the family to provide these opportunities (Medlin, 2013). To respond to the need for social enabling, we deliberately schedule Maker Academy activities that facilitate these softer skills. Makers may work on individual projects, helping each other as needed, but they also have group projects that they develop collaboratively. They may divide into groups to make gravity powered go-carts where they have to share design decisions, take turns using tools, and agree on a team name and logo. Sometimes they construct individual paper roller coasters, but then they combine their individual models into one big camp model. Simply having a camp experience lets participants take part in positive social interactions, while group activities encourage them to practice brainstorming, collaboration, and consensus-building skills. As a further way to inject social skills, we incorporate a grand Show and Tell on the last day of camp. We invite friends and families to see the final results of what their children have been doing. Makers show what they have made, explain how they made it, and what they learned along the way. They often will take their parents on a tour of the Maker Lab, explaining in detail how the machines work and how they used them. We serve refreshments, and there is lots of interaction. The whole event serves to clinch the camp experience for everyone. A fun presentation time completes the creative cycle for makers by allowing them to share their results and practice answering questions publicly. Parents see evidence of the broader, holistic social skills beyond just the technical learning. Evaluation is an important yet often challenging part of every library initiative. It is especially crucial for a nontraditional service like makerspaces and youth day camps since university administration may question the expenditure of time and effort on a population not directly affiliated with the institution. Gibson and Dixon (2011) offer a framework that libraries can use for assessing the impact of various programs. It is particularly relevant in that it stresses degree of engagement rather than only the metrics of attendance and popularity as indicators of success. Effectiveness encompasses not only how many people a program reached but also the depth of outreach. Were we effective in reaching people in terms of numbers, and how wide a net did we cast? Were we inclusive? Our original outreach to faculty families and public schools was not very effective. It garnered only 12 responses for our three maker camps. It was not until we serendipitously discovered the additional segment of the homeschool community that our outreach became more effective. We went from 12 campers that we had to go to great lengths to recruit to registration that now fills up within the first day, plus a waitlist. The key for us was learning about the homeschool segment of our community, and how they communicate. Our typical outreach channels were too narrow; they excluded this significant community. We had to broaden our promotional methods to include more than we had been doing. Proof of educational benefit is especially important for academic libraries. Academic libraries are, at their heart, educational institutions. Their mission is tied to learning. While gate counts and program attendance can indicate popularity, the deeper question we have to answer is whether or not anyone learned anything worthwhile. Fortunately, educational evidence is fairly easy for something like Maker Academy. The objects the campers make serve as proof of what they learned. Campers make T-shirts, build catapults, assemble speakers powered by a raspberry pi, create robotic drawing machines from a small motor, and make many other things. Parents see these objects displayed in the Show and Tell at the close of camp, the children can explain how their creations work, and they can take their projects home. These objects are physical evidence of learning. Paper roller coaster activity and whiteboard showing lessons learned from the project. From ACU Maker Academy 2017. Heavy goes slow. Light goes fast. According to Gibson and Dixon (2011), strategic positioning involves factors like increasing the attractiveness of the library as a partner, developing friends and allies, and increasing the quality of relationships. It implies taking conscious steps that will put the library in a good place in the future. With noticeable growth of homeschooling (Ray, 2018), it is likely that a significant portion of future college students will come from a homeschool environment. Colleges and universities would benefit by cultivating relationships with this market segment. Library programming, particularly that which involves creating something, can play a part in recruiting (Scalfani & Shedd, 2015). At ACU, Maker Academy brings many people to campus who would not otherwise come. It introduces them to the layout of the buildings. It gets them inside the library where they see the environment, meet the librarians, and hopefully learn that the campus is not totally closed off to them. Inviting them here early encourages them to think favorably about higher education, and possibly the library’s parent institution, as part of their future. Making friends with external constituencies, demonstrating how the university is a partner for success, and aiding in recruiting are all forms of social capital that administrators value. Outcomes refer to changed behaviors or attitudes that program participants exhibit as a result of the program. We see program outcomes in the form of voluntary extra involvement in the Maker Lab. This comes from homeschool co-ops who want to bring their group in for a tour and a hands-on activity. It also comes from a homeschool robotics group that designs robotic parts with the open source software they learned in Maker Academy and visits in person to print the parts using our 3D printers. A particularly significant outcome indicator is when we host a Maker Festival and some of the young Maker Academy graduates volunteer to exhibit new things they have made or to teach a workshop on a skill they have learned in the makerspace (Image 2). Going from student to teacher is a powerful outcome. Using maker day camps as an outreach tool has been a very successful program for us. We learned some important lessons about our users as well as about our own practices. But these lessons are not only for us. They can speak to other libraries as well. Libraries of all types seek to serve others. Whether providing storytime in a public library, curriculum resources for a school, or research help for a paper or dissertation, we all seek to connect our services with others’ needs. Serving our patrons starts with an awareness of them. It may be that other libraries, like ours, tend to define our patron base too narrowly. We use more effort to look in the same places using the same outreach tools and fail to realize who we might be missing in the process. For ACU, that group was homeschoolers. Simply asking the question, “Who are we missing?” is a good reminder for all of us to look more widely and inclusively at those we can reach. Secondly, we in libraries can realize that we have more to offer than we may think. Pedagogical research has long advocated for participatory learning, social engagement, reflective inquiry, and technology blended with traditional methods. Libraries offer these things, and they are a natural match for homeschool families. Hands-on activities, group learning, and teaching with open source tools are what libraries do, and makerspaces are innately geared to many of the forms of teaching and learning that educational reform is calling for. Libraries can confidently come forward to show how we demonstrate solutions and learning outcomes, and we can be leaders in reaching new markets beyond the people already on campus. Incorporating families who school at home into the library’s larger community is first a matter of communication rather than one of program content. Many of the needs and interests of homeschool families are similar to those in mainstream education. Hilyard notes, “The only real challenge libraries face in serving homeschooling families is reaching them.” (2008, p. 18). Ten years later, this initial challenge remains the same today. Plugging into the already existent local listservs and co-ops is imperative and transformed our effectiveness in reaching those around us. Part of thinking beyond the immediate college-age population is thinking more inclusively of special interest segments of a library’s external community. For us, this special interest was those who homeschool. Parents, children, and—in the future—teachers and homeschool co-ops are all part of our expanded patron base. We remind ourselves that sometimes success depends less on fishing in the same spot but on how wide we cast our nets. My gratitude goes out to Sarah Naper, external reviewer for this article, and to Amy Koester, internal reviewer. You gave extensively of your time and experience, and you encouraged me to go deeper by your questions. Not only this article but this librarian is better because of your involvement. Thanks, too, to Kellee Warren whose work as publishing editor guided me through the publication process, further polished the article, and kept me focused along the way. To Darren Wilson and my other colleagues in the ACU Library Maker Lab, thanks for your work every day and for making learning fun. Blankenship, C. (2008). “Is today a homeschool day at the library?” Public Libraries, 47(5), 24–26. Dougherty, D. (2013). The maker mindset. In M. Honey & D. E. Kanter (Eds. ), Design, Make, Play: Growing the Next Generation of STEM Innovators, (pp. 7–11). New York, NY: Routledge. Hilyard, N. B. (2008). Welcoming homeschoolers to the library. Special Section, 47(5), 17–27. Huge, S., Houdek, B., & Saines, S. (2002). Teams and tasks: Active bibliographic instruction with high school students in a summer engineering program. At Ohio University, 63(5), 335–337. Johnson, A. (2012). Youth matters: Make room for homeschoolers. American Libraries, 43(5/6), 86–86. Kunzman, R. (2016). Homeschooler socialization: Skills, values, and citizenship. In M. Gaither (Ed. ), The Wiley Handbook of Home Education. John Wiley & Sons, Inc.
Lou, N., & Peek, K. (2016, February 23). By the numbers: The rise of the makerspace. Popular Science, 288(2), 88. Mishler, T. (2013). Hands-on homeschool programs. Florida Libraries, 56(1), 7–8. Paradise, C. (2008). Our homeschool alliance is a winner. Public Libraries, 47(5), 21–22. Scalfani, V. F., & Shedd, L. C. (2015). Recruiting students to campus. College & Research Libraries News, 76(2), 76–91. Shinn, L. (2008). A home away from home: Libraries & homeschoolers. School Library Journal, 54(8), 38–42. Turner, M. L. (2016). Getting to know homeschoolers. Journal of College Admission, 233, 40–43. Tvaruzka, K. (2009). Warning: children in the library! Welcoming children and families into the academic library. Education Libraries, 32(2), 21–26. Willingham, T. (2008). Libraries and homeschoolers: Our shared common ground. Knowledge Quest, 37(1), 58–63. As a formerly homeschooled kid who’s now a college librarian… love it!